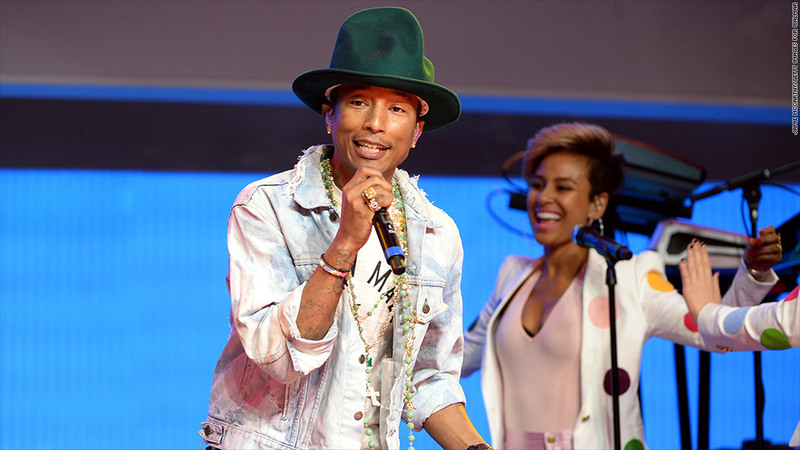 Pharrell Williams performed his popular hit "Happy" at Wal-Mart's annual meeting Friday. Big stars like Pharrell Williams and Harry Connick, Jr. entertained Wal-Mart employees and shareholders at the company's grand annual meeting on Friday. But underneath all that glitz, some shareholders were bristling about the lack of accountability from the world's largest retailer. At issue was a far-reaching scandal involving bribes allegedly paid by Wal-Mart (WMT) in several foreign countries, including Mexico, India, China and Brazil. At least two federal agencies -- the Justice Department and the Securities and Exchange Commission -- are investigating the company for violations of U.S. law under which it is illegal for company employees to make payments to foreign officials. Since the allegations were first revealed two years ago by The New York Times, Wal-Mart admits it has spent $439 million on compliance and investigation costs. Wal-Mart has also from time to time suspended employees. However, Wal-Mart said Friday that has not taken back any pay from employees who were linked with the bribes even though the company claims to have strong policies in place to take back compensation from any executives engaged in wrongdoing. Wal-Mart spokesman Randy Hargrove said, "There have been no claw backs associated with any of the Wal-Mart employees or former employees linked to the bribery probe." Hargrove also said that the federal investigation is "ongoing." At Friday's meeting, shareholders put up a proposal to Walmart's board to annually disclose whether or not the company has recouped any incentive compensation from senior executives for "misconduct that exposes the company to serious financial, legal, and reputational risks." The proposal did not receive enough investor votes to pass. "For us the disclosure policy is the best window into how the board is dealing with misconduct," said Meredith Miller, who runs compliance for the United Auto Workers Retiree Medical Benefits Trust, which co-sponsored the proposal. It was supported by several shareholder advisory groups such as ISS and Glass Lewis. Milller's coalition holds $200 million of Wal-Mart stock. Though the company hasn't said much about the scandal, many of the leaders who helped run Wal-Mart's Mexico business have since left. Eduardo Castro-Wright, the former CEO of Wal-Mart de Mexico and former head of Wal-Mart U.S., retired soon after the allegations were revealed in 2012. The New York Times had named Castro-Wright as one of the main executives who orchestrated millions of dollars of bribes in Mexico to secure construction permits. Thomas Mars, who was Wal-Mart's general counsel in 2005, and eventually became Wal-Mart's chief administrative officer, resigned last year. The general counsel of Wal-Mart's Mexico subsidiary left the year before. Mike Duke, Wal-Mart's CEO since 2009 stepped down earlier this year. Duke ran Wal-Mart's international operations from 2005 to 2009. The value of his retirement account jump more than 23% to $140 million in his last year at the company. Both the U.S. Department of Justice and the Security and Exchange Commission declined to comment on where the Wal-Mart investigations stand.